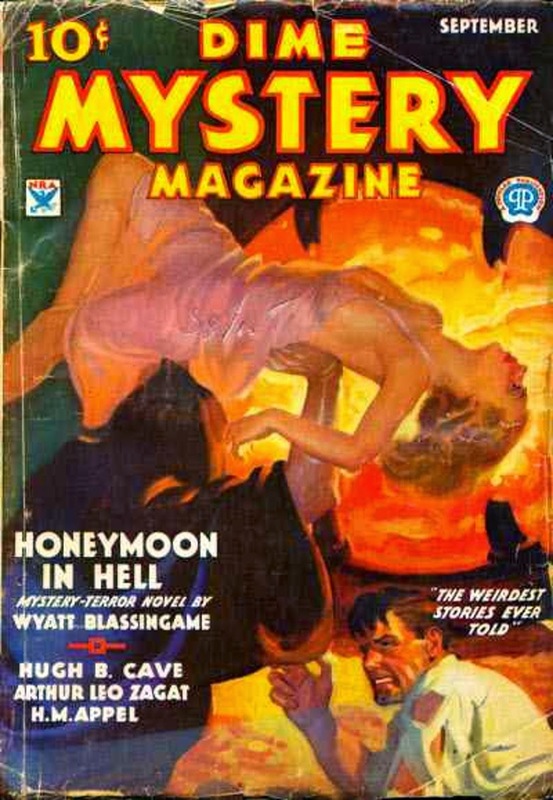 Time for another Weird Menace cover, this time from one of the leading magazines in the genre, DIME MYSTERY, featuring a suitably lurid cover by Walter Baumhofer and stories by three of the top authors, Wyatt Blassingame, Hugh B. Cave, and Arthur Leo Zagat. I've given some serious thought to doing a Weird Menace anthology for Rough Edges Press, writing one of the stories myself and opening up the rest of the book to submissions from anyone who's interested. I'd want period stories, because I'm not sure the genre would work in any other era than the Thirties. But I'm not sure there's enough of an audience for such a book or writers who would want to contribute. Still, I'm intrigued by the idea. If you have any thoughts on the matter, feel free to post in the comments or email me directly. If you go forward with this, it would be hard for me to resist doing a story. Well, I'd certainly buy that book. And probably submit a tale for consideration, too. Which might expose the limitations of such a retro-collection-- the people interested in writing for it might well represent the majority of the people willing to read it. The same thought occurred to me. Still, enough people have expressed an interest that I'm leaning toward doing it, if only because then I'd have an excuse for writing a story of my own. I'm going to put together some submission guidelines. Glad to hear it, James. I would certainly buy it and would try to submit something for it. Sounds fun, something a bit off beat. I like the idea. Thanks for the information. I was sort of out of the loop while Price was doing most of his publishing, so I wasn't aware of this.